I’d been meaning to finally read something by Bill Bryson and I was happy to find that my local library’s digital collection includes lots of his titles in ebook and audio formats. I’m not an outdoors person, which is exactly why I chose A Walk in the Woods. 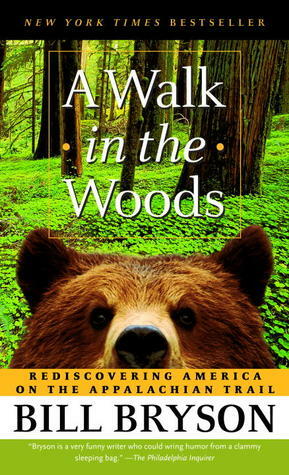 Bryson does a wonderful job merging an entertaining narrative with lots of information about the Appalachian Trail, its statistics and history. I laughed out loud, a welcome diversion from some of the other reading materials I’m lately engaged in (not those below). I did find some of the environmental asides a bit heavy-handed, only because they seemed pushy in light of the rest of the tone. But this is definitely not the last book by Bill Bryson that I’ll be reading. “This Is a Letter to My Son” by KJ Kabza – I always have an eye out for KJ’s fiction. Luckily, he’s on Twitter! What if we had a choice about how we intrinsically think about ourselves? Would we change? Should we change? Even if we seem to have a really good reason? This is a concise, beautiful near-future science fiction story about those questions. “The Right Sort of Monsters” by Kelly Sandoval – Conversely, Kelly Sandoval was completely new to me (I think…). A fallen god (literally) and a grove of trees that provide a very special type of fruit for childless families. Of course, a sacrifice is required. (Art at left by Galen Dara.) Together, these two stories would make a great Mothers’ Day issue. And I’m counting “The Right Sort of Monsters” as my first official Once Upon a Time read. I love Bryson and that is one of my favorites.